Mark Winchel tends to his aquaponics system. Photo courtesy of Aquaponics North. Growing produce year-round in northwest Montana may sound complicated, but the owner of Aquaponics North, Mark Winchel, is keeping it simple. Before turning to aquaponics, Winchel ran a horticultural business for 23 years and has learned that one of the biggest mistakes an entrepreneur could make is trying to grow too fast, too soon—putting the cart before the horse, as he says. The economy of aquaponics itself appealed to Winchel when he first started researching it three years ago. He appreciates that the vertical system he developed with the help of Bright Agrotech, which he highly recommends as a training resource, makes good use of space. As someone passionate about sustainability, he also notes that aquaponics, unlike hydroponics, doesn’t produce a briny waste. Also, the energy required to heat his fish tanks does double duty keeping his greenhouse warm in the dead of winter. “There’s a lot of shared symbiotic relationships that go into aquaponics, with heat being one of them,” he explains. The most important symbiotic relationship, of course, is that of the plants with the fish. Unlike some aquaponics ventures, Winchel doesn’t raise his fish to sell. Even if the fish regulations in Montana weren’t as tight as they are, he says that butchering his fish wouldn’t yield much of a profit. Instead, he views his fish much like another farmer might view laying hens; the animals continually produce a resource that the farmer needs. The fish don’t lay eggs, but they do produce the organic fertilizer for the plants. Part of his plan to keep it simple was to start small, giving Winchel and his partner Lee Anne Christiansen a chance to experiment. Currently they’re working in a 25 x 10-foot space, but will increase to 60 x 40 in the spring. 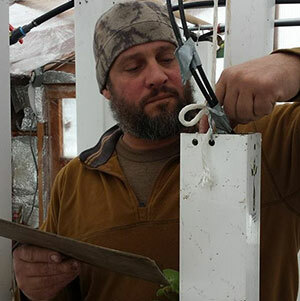 To help pay for the new greenhouse, he’s considered some crowdfunding ventures that focus on agriculture, and he has spent much of this winter preparing for that campaign. Small production space means an initially low yield, and Winchel chuckles when he says he’s working on just providing a consistent product to two local, organically inclined restaurants. After the expansion he may look into other local specialty restaurants and health food stores, but he has no intention of trying to compete with the large-scale organic produce in the grocery store, where he believes customers tend to care more about price than how far a head of lettuce traveled to get to the shelves. Even without the large grocery stores, Winchel says the local market is strong enough to keep him busy for a while. He says there are a lot of tourists and specialty restaurants in the area, with many people who are very health-conscious and willing to spend a little more on local, organic produce. Proprietors he’s acquainted with have all told him that, if he has the produce available, they would be happy to purchase from him. Keeping things simple, for Winchel, doesn’t rule out creativity, and in the future he may seek to further diversify his customer base with something like a CSA. No matter what, keeping his produce local is a high priority.